The Minerva MZX-c range of conventional twin wire fire alarm control panels will satisfy a wide range of applications from 2 to 8 zones and have many features that are normally associated with more expensive addressable systems. The Minerva MZX-c range of conventional fire detection control panels are designed to be both installer and user friendly. A high degree of flexibility and programmability allows the systems to be customised without the need for any configuration software. 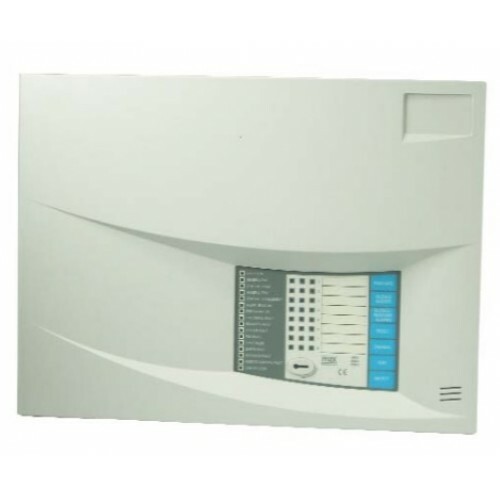 The range consists of 2, 4 and 8 zone panels together with an 8 zone repeater which is compatible with the 4 and 8 zone variants. The matching repeater panel has an inbuilt 240Vac power supply. 2, 4 and 8 zone versions available. Supports Tyco twin wire sounders on all eight detection zones. Drives up to 3 repeater panels (4 and 8 zone panels). Access to controls via key switch. Space for 2 x 3.4 A/H batteries providing up to 72 hour standby. Remote control inputs for class change, alert, evacuate, silence alarms and reset. Zone 1 configurable for latching or non latching. Selectable zonal or general alarm sounder operation. Configurable zone co-incidence for automatic detectors. Fully monitored fire signalling output. Single pole volt free change over fire relay output. Single pole volt free change over fail safe fault relay output. Auxiliary 24VDC 250mA power supply output. Open collector output for buzzer active, disablement active and evacuate active. Zone/Output disablement for each zone, fire signal output and all sounders. Automatic fire detector and manual alarm call point fire event discrimination. Compatible with diode bases for detector removal.